Switch plates in the home often go unnoticed in the overall decor of the interior. Despite this, these small little accents can help define the overall feel of a room and bring a sense of consistency throughout an entire home if desired. Best of all, they serve an important practical use: protecting adults and children alike when using switches, outlets and other electrical hookups. When looking for a new set of switch plates or replacements to buy, you will encounter a wide variety of styles and setups. These plates are often designed to hold a mix of one or two switches, dimmer switches or outlets. Many people find switch plates to be a good accent piece to enhance the style of a room’s overall decor. They come in traditional and minimal styles, so you can choose how much ornamentation or simplicity you want from the plates. Here, the best switch plate covers for your home. A single switch plate cover is one of the most basic switch plates you can buy for the home. Common in rooms with a single light source, these plates help to keep single light switches protected while sealing off the harmful electrical contents behind. If you're looking for a simple and elegant design for a single switch plate, the best choice to consider is the Enerlites 8811-W set. This pack includes ten white covers designed for a single common light switch. The cover is secured with two screws that fasten right into the metal brackets of the switch, keeping the plate from moving around the wall surface. Made of polycarbonate plastic, the cover will also resist dents, scratches and breakage for homes with pets and little children. Double switch plate covers are perhaps the most common type of switch plate in a home since they provide equal protection for two similar switches. In rooms with multiple light sources, outlets or even fans, this type of switch plate is perfect for creating a unified look for the lighting controls. Sometimes, you can even use multiple double switch plates in a single room to group the switches together in a more logical configuration. The Franklin Brass W35244-PW-C Classic sports a decorative design that will fit right in with traditional, vintage or other older interior styles. A single raised line adorns the pure white finish to add some visual interest without going overboard. Beyond protecting two standard light switches, the ornate design of this cover makes it a great addition for anyone wanting to add a bit of designer accent to the room. 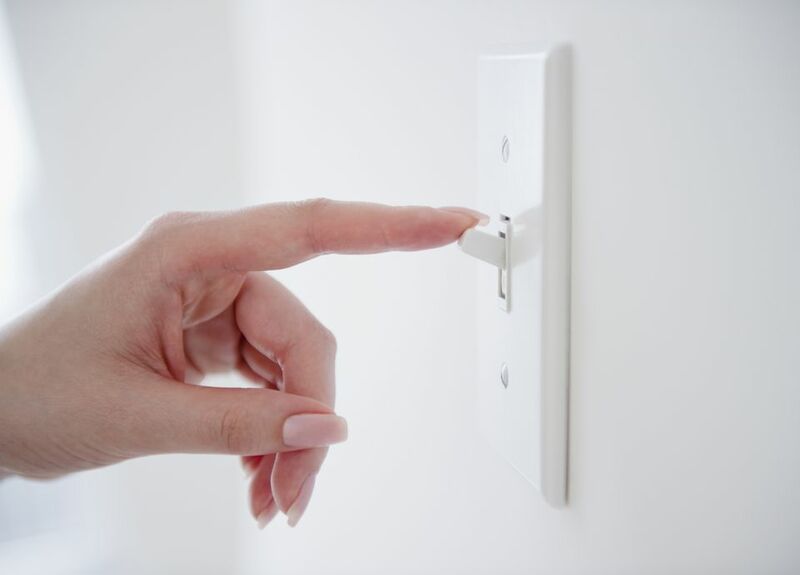 If you have multiple switches to control a variety of lights, outlets and other electrical sources in a room, you are going to need a switch plate to match the complex setup of the switches. Often coming in groups of three or four, switch plates for multiple switches are great for organizing this mess of controls into a single, unified switch area. Best of all, the best multiple switch plate cover comes in a simple, straightforward style that will blend in with a variety of room colors and cores. The Leviton 80732-W is a massive, pure white cover that can accommodate a number of different light switch and dimmer switch brands. The layout of the cover includes slots for three single switches with a larger dimmer slot on the left. The smooth face is impact and scratch resistant so you can install this plate in larger rooms where high traffic and daily use would abuse lesser switch plate options. Sometimes, the typical subtle look of a switch plate just doesn't do it to enhance a room’s interior style. If you want to get more decorative and ornate with your switch plate covers, you'll have to look for the right design so the overall style doesn't clash with the rest of the room. Decorative switch plates are a great way to create little points of accent design and color without spending a fortune on unique artwork and furniture pieces. To go all out with your decorative flair, the Franklin Brass W35068-SN-C sports a massive four-switch setup that will stand out in larger rooms without becoming a focal point. The cover features an elegant, beaded trim around the edge in a satin nickel finish. Unlike other common switch plate options, this one is made of pure zinc for extra durability and longevity to protect the function and looks of the cover for years to come. Beyond the single or multiple switch design, another common layout for switch plate covers is a switch/outlet combination. This type of switch plate is perfect anytime you need an electrical outlet in a higher position than common wall outlets. Good for bathrooms, kitchens, craft rooms and more, this type of layout will keep the electrical contents protected while providing an extra source of electricity in the room. The Liberty Stamped Round Cover is all about simplicity. The pure white, rounded edge cover has room for a single light switch and a duplex outlet. With a reflective, smooth finish protecting the surface of the cover, the overall design adds a hint of visual accent to the room. Best of all, the clean look will work with several color schemes so you can use it with solid or patterned painted walls with ease. It can be difficult to add a sense of decoration and design with uncommon switch plate cover layouts like the single switch/outlet setup. Since this type of design is primarily used in specific rooms like bathrooms and kitchens, you normally have to do a little more searching to get the right look down. Fortunately, the Hampton Bay Architectural Cover will provide ​an ornate yet subtle design to these rooms without breaking the bank. The Architectural Cover mixes a little bit of old and new into a single design. Using a single switch and duplex outlet layout, the cover is made of solid zinc to protect the surface from abuse. The satin nickel finish modernizes the overall style of the cover while the picture frame-like edge preserves a sense of elegance. The footprint of the cover is also slightly larger than typical switch plates, increasing the visual presence of the cover in larger rooms. A dimmer switch can bring in an extra sense of atmosphere and emotion to a room. By controlling the light source, you can choose whatever intensity level is best for the mood. Unfortunately, you also need a unique type of switch plate cover to protect the larger surface area of the switch. Coming in a dual setup layout, the Leviton Decora works with a variety of dimmer switches so you do not have to worry about finding covers that are compatible with your unique control layout. The Decora makes it easy to use an assortment of dimmer and oversized switches in a single room. Perfect for family, living, and media rooms, the four switch setup keeps the control surface clean and organized while hiding the harmful wires inside. Using nylon plastic, the cover is virtually unbreakable once it is fastened to the wall.